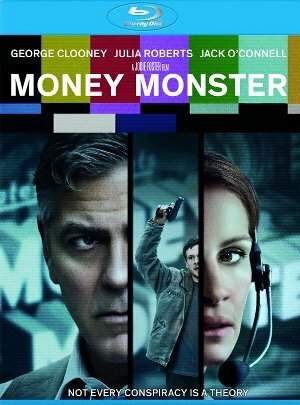 Director Jodie Foster's Money Monster is an intriguing set-up that gets lost along the way falling down a rabbit hole of conspiracy and increasingly hard-to-swallow events. The film features George Clooney, as the cable host of a financial program known more for its host's outrageous behavior than honest stock tips, and Julia Roberts as his disapproving producer. When one of his viewers (Jack O'Connell) shows up with a gun and a bomb vest demanding answers to how a guaranteed stock dropped due to an unexplained "glitch," cast and crew are held hostage and forced to begin investigating matters. Rather than delve into the instability of the market or take a hard look at the crapshoot million Americans bet their futures on, the film devolves into a conspiracy tale as the gunman's wild accusations begin to come true. Available on both Blu-ray and DVD, extras include deleted scenes, music video, and featurettes on Clooney's character, the movie's dramatic moments, and the film's ending.